Are we becoming Greece? Perhaps, but I believe there is a better example somewhat closer to home – The Civil War of 1861-1865. No, I’m not saying that half the country will soon secede, or that we are headed for mass casualties. This will be different. But, it will also be the same in many respects. Did you ever wonder why the South waited until 1860 to secede? Why not 1858 or 1863? What was the precipitating event that made push come to shove at that exact moment? Why was it that our political system could not resolve those issues peacefully? What was it about slavery and states rights that rendered the political system useless? Is it even remotely possible that we have some of the same types of issues today? Again, I’m not suggesting that violence is a given. After all, there have been bloodless revolutions throughout history. But, if there is going to be another civil war, peaceful or otherwise, here is the Who, What, Where, When, and Why, using 1860 as a roadmap. When you think about it, The Civil War was fought nominally over slavery and state’s rights, but at its core the issue was economics. The South did not secede from the union because they liked abusing Africans and wanted to continue doing so! They seceded because they were married to an economic system based on slavery. To the South, slave labor had become an entitlement, and they were afraid of losing it. For generations, slaveholders and their economic counter-parties had enjoyed outsized living standards based on their slave labor entitlement. As they saw it, these plantation owners were not doing anything particularly radical for their time. Slave owning had been going on uninterrupted throughout history. It was their birthright, and it was legal. They didn’t create the system. They were born into it. The economics and morality of our entitlement system today are essentially the same as the slavery entitlement in 1860. Have you not heard credible analysts say we are enslaving our heirs? That is not to imply any equivalence with the treatment of black slaves, only that we are making a similar claim on the labor of others. Has it not occurred to you that this is as morally wrong today as it was then? Put in those terms, our issues today are eerily similar. Slave owners were living an unsustainable lifestyle off the labor of their slaves. We are living an unsustainable lifestyle off the future labor of our heirs. This money has to be paid back in some form of reduced living standards. It could be higher taxes, or a weakened currency, or reduced national security, or some combination of the above, but there is no other way out. Remember, we are talking here about structural debt. This cannot be blamed on so-called unfunded wars or other emergency spending. No major war in history has ever been funded without debt. Similarly, improving a standing defense, exploring space, building infrastructure and a national park system, or re-building after a disaster, are all things worth borrowing for. The true test however, is how well we retire our debts during peacetime and prosperity. Unfortunately, we have failed that test time and time again. Even when there were projected “balanced budgets”, like in the ‘90s, we never included the off-balance-sheet items or the unfunded liabilities that should have been in the equation. Those budgets were only in balance due to the government-mortgage-entitlement housing boom done on the backs of Fannie Mae and and Freddie Mac, which were off the balance-sheet. Balance was a mirage as evidenced by the housing collapse and the Great Recession. Our structural debt is nothing more than inter-generational theft. Unfortunately, economic systems and morality seem to be two of the things mankind has found to be worth fighting for, and even dying for. (The others being, food, religion, women, and sports teams) Thus, despite constant efforts to resolve the slavery question, by 1860, an impasse had been reached between economics and morality. The morality of today’s entitlement/enslavement system is part of what animated ordinary Americans to take to the streets and speak out against runaway spending, taxing, money printing, and borrowing at modern-day “Tea Parties”. These people see themselves as today’s abolitionists, fighting against enslaving our heirs. They are also acting in their own economic interest protesting against being further enslaved themselves. Social Security is often referred to as the “third-rail of American politics”; touch it, and you’re dead! Slavery was the third-rail issue of its day. Note, that in the above quote from Lincoln, he had to say that he wasn’t going to touch slavery in the existing slave states. That’s how he got elected. He couldn’t alienate too many voters or he’d have lost. If slavery was so immoral, wasn’t it Lincoln’s obligation as President to try to abolish it everywhere? Of course, but he couldn’t say that while running. Our entire entitlement system has become a third-rail issue, and no politician can speak frankly about any of it. Did you see what happened to Paul Ryan recently? Or Rick Perry, when he called Social Security a Ponzi Scheme? If politicians can’t even talk about this, how can the political system hope to resolve it? Obviously, in 1860, slaves could not vote. Neither can the inheritors of our sixteen trillion dollars of self-indulgence; in most cases, they are not yet born. This just underscores the potential moral conflict we are facing. As in 1860, a disenfranchised victim class has magnified the passion on the abolitionist side. So why did the Civil War start at that exact moment in 1861? The precipitating factor was the polarized election of 1860 and Abraham Lincoln’s victory. Back in 1860, Lincoln’s Republican Party was the nominally abolitionist party. Moreover, prior to 1860, presidential tickets had traditionally been split between a Northerner and a Southerner, but both Lincoln and his Vice President, Hamlin, were from the North. So, for the first time, two Northerners from the nominally abolitionist party had won the executive branch in a very polarized election. Southern states immediately began seceding in December 1860, and by the time Lincoln was sworn in on March 4th 1861, a dispute over who owned the Southern forts was fast coming to a boil. That is what led to the shooting war, which began at Fort Sumter, SC on April 12th, 1861. The 2012 election also comes at a similar time of great polarization. (If we’re lucky, we may even know the outcome in November!) Regardless how it turns out, on some level, it will be a contest between the entitled and the enslaved. In fact, both factions have already been in the streets within the last year in some form or other. If the results are seen as an imminent threat to the entitled, they will defend their claim. If the results are seen as an imminent threat to the enslaved, they will strike. As can be seen above, today we have multiple political borders instead of the big, stark, North/South one in 1860. It is possible our map for 2012 will look very different, especially if we have third party and even fourth party entrants. 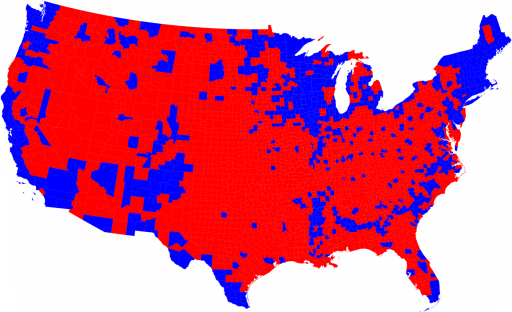 One thing we do know today; arrests at Occupy Wall Street protests in 2011 can be well correlated with the 2008 county map! The Southern states began seceding from the Union immediately after Lincoln’s election in an attempt to defend their entitlement. If electoral results go the way they did in 1860, and the entitled sense a threat, they will similarly defend their claim. Remember what happened in Wisconsin when the Governor tried to roll back the public union entitlement system? Have you seen Greece lately? Have you ever been involved in a union strike? Rolling back economic systems, once they are viewed as entitlements, cannot be done without resistance. On a big enough scale, that resistance can become dangerous. But, there is another scenario. If the election goes the other way, and the entitlement system continues unabated, the entitlement financiers will eventually strike. This strike will be manifest through the bond and currency markets and will be even more jarring than a political shift. However, the timing of that strike will be difficult to know. That is what happened in Greece. The bond market turned Greek debt into junk, and the euro financiers eventually imposed a forced “austerity”. That sent the angry entitled into the streets. The 2012 election outcome may determine the exact timing, but the eventual result will be the same either way; the entitled will defend their claim, regardless of whether the bond market or some political party threatens it. In 1860, the entitled were the South and anyone who benefitted from slavery. Among the 50% who pay no income tax? A student with a big loan? Then, you may be part of the entitled class! How about Warren Buffett, is he part of the entitled class? He may be. He has access to the highest levels of government, gets insider treatment, makes much of his fortune from the insurance industry (which benefits from favorable tax and regulatory policies), gets favorable terms from bailed-out banks, and is able to avoid most taxes. How about a Goldman Sachs executive making millions per year? Without government support in the form of bailouts, subsidized interest rates from the Fed, implied to-big-to-fail subsidies, crony deal-making, and the like, this executive would not be nearly as wealthy. And then there are the obvious entitled: Everyone over 65 (via Medicare and Social Security), The poor (via Medicaid, Food Stamps, housing, EITC, and other support), Federal, state, and local, government workers (via bulletproof job security, and above-market wages, benefits and pensions), University professors (via government subsidized wages, benefits, and pensions, even at private institutions, which all receive government support!). In other words, politicians have been building the entitled class for 100 years and it is now to the point that everyone is, more or less a part of it. Conveniently, the ones paying can’t vote! So, who exactly is in the enslaved class? In 1860, they were the slaves themselves, their moral brethren in the abolitionist movement, and ultimately the North. Today, they are the young and the unborn, the few who have managed to avoid being part of the entitled class, and the financiers (The financiers are the 50% who pay income tax, the Chinese, and Investors, to name a few). As in 1860, when families ended up on both sides of the North/South dispute, the entitled/enslaved line will not always be clear. Many people will fall comfortably in both camps. In the end, how one views the moral issues, and what one does about it, will determine where one ends-up. Although, the tensions we faced in 1860 and those today are primarily economic, race was a factor then as it is now. Racism in the South made it easier for them to rationalize the practice of enslaving black Africans. Racism was a real issue then. Today, Barack Obama’s race could be misconstrued as a factor if he is defeated after one term. I say “misconstrued” because everyone knew Barack Obama’s race in 2008, and he was overwhelmingly elected. This proves that a defeat in 2012 would reflect something new, something we’ve learned about him during the last 4 years, and that cannot be his race! Yet tragically, angry voices have raised the charge of racism with every bit of criticism during Obama’s Presidency. Some of this rhetoric has been inflammatory, and it seems to be getting worse as the election nears. Ironically, the economic agenda pursued by Barack Obama has placed an increasingly large segment of the black population in the entitled class. Unemployment, dependency, and political polarization among blacks are all at record levels. The descendents of 1860’s slaves are today unwittingly enslaving their own heirs! Pray for a Leader. Republicans think they are trying to fill Reagan’s shoes. They may need to fill Lincoln’s shoes instead. Amend the Constitution. A debt limit amendment, not just a balanced budget amendment, would go a long way towards avoiding enslaving our heirs. Look in the mirror. You probably feel entitled, and you are engaged in an immoral transaction. Vote morally. “Social Justice” cannot be moral when done on the backs of the unborn. Be realistic and be prepared. This may all work out fine, but history suggests otherwise. No matter how you slice it, based on the numbers, Barack Obama will have ironically done more to enslave his heirs than any other President in history. Yet, to the beneficiaries of this economic system, he is an icon. Meanwhile, the abolitionists have come to the conclusion that enslaving our heirs is immoral, and the financiers are, as always, one bond auction away from pulling the plug. We’ve already seen thousands of arrests and some violence in the streets in 2011, but that may have been a mere dress rehearsal for what may come in late 2012 or 2013. I hope not. I’d love to see a peaceful reconciliation of these issues. That said; when it comes to economics and morality, we’ve seen this movie before, and it doesn’t end well.